The Topaz is the official gemstone for the month of November, which is not only beautiful but powerful as well. Produced in several different shades although this festive tone of mid to dark amber (sometimes orange in appearance) is the most popular, topaz still remains one of the most sought-after rocks by meditative healers dating back to centuries ago. Among one of the reasons is its supposed ability to bring good luck and fortune, nicknamed the “bringer of abundance” by many natural enthusiasts. Originally, the stone dates back to 2000 years ago where it was found on a tiny Greek island that was eventually named Tapazios in honor of the prosperity being mined there. Later the name was changed to St. John’s Island where many tourists visit each year to enjoy the opulent surroundings. Though, being a wealth inducer is only one property of Topaz, wearers will also be thrilled it may also lower anxiety, increase relaxation and relief stress. It is said that those who are less engaged with western medicine would rather place topaz stones around their homes to boost overall health and discourage illness for anyone present in the home. One more reason to invest in this gem is if you’re a romantic who has an upcoming wedding anniversary! Blue topaz is officially the gift for celebrating four years of marriage while the golden imperial represents the sixteenth and twenty-third but in general, this is a wonderful stone to present to your spouse on any occasion. If you’re a florist who is trying to replicate the appearance of the topaz within a special flower arrangement, you have some options available to you due to the large spectrum of color that exists. In some cases, designers might want to rely on the “feel” of the stone such as its regal personality or magical sense. Here are a few suggestions to browse over if you have a special someone celebrating a November topaz birthday. Orange mango callas just might be the most beautiful contrast to the topaz gemstone. These beauties are a “no-fuss” variety that are truly gorgeous when they are placed in a vase with no other species mixed in to distract attention. Easy, elegant and enticing, you can’t go wrong with a similar arrangement. 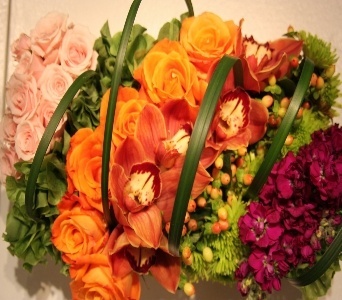 These delicious orange mokara orchids will also do the trick and have your special someone in awe over this delicate tropical display. The puffy blooms run up and down the stem and possess a longevity property that will keep them healthy for over a week or more when taken care of properly. Everyone’s favorites are usually the gerbera daisy because of their sweet and happy appeal so why not request a bundle in the topaz shades of orange? The gerbera daisy has a significantly long list of colors to choose from which are shipped to the U.S daily.